Import data from an Excel or ASCII file into a List Control based on a SQL Database. If a List control in a UX component is based on data from a SQL database you can upload an Excel or Ascii file (containing CSV data - comma separated values) and import the data in the file into the SQL table the List Control is based on. After the data is imported, the List is automatically refreshed. If a List is based on a stored procedure, data cannot be imported into the List using this action. The data in the uploaded file must use field names that match the column names in the target SQL table. In the case of a CSV file, the field names must be specified in the first row of data in the file. In the case of an Excel file, column headings in the first row must match the field names. In the case of an Excel file, if the file has multiple tabs, the data on the first tab is imported. Field names in uploaded file cannot contain spaces, or special characters. This will open the builder where you can define the define the target List control into which you want to import data. Error message shown when a file with an invalid extension is chosen. Specify the type of progress bar. The 'A5' bar uses a specially styled progress bar that blends well with the selected component style. If you are using certain styles (e.g. GrBlue, GrOlive, etc.) you may want to switch to the 'Basic' style. Choices include A5 and Basic. Specify the text for the prompt that appears above the file box. If you use a language tag for the text, be sure that the language definition returns a URL encoded value. See hyperlink below for more help. The name of the List control into which you want to import data. The data are actually imported into the table in the SQL database that the List is based on. Only Lists that are based on SQL databases (and do not use stored procedures for the List query) are eligible targets. 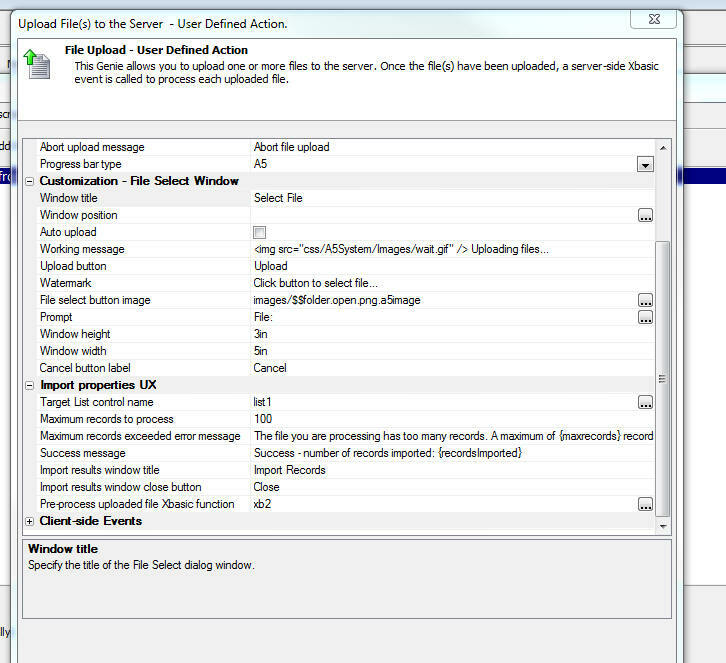 Specify the maximum number of records in the uploaded file to process. Importing records can tie up your server so you might want to limit the number of records that can be processed. Set to 0 for no limit. If the uploaded file contains more records that the specified maximum, no data are imported. After the file has been uploaded you can call an Xbasic function to validate the data before it is imported into the target table. Your Xbasic function gets passed an array with all of the data to be imported. Your code can modify the data in the array or delete array entries that do not meet validation criteria.